Washington's diverse geography is a wonderland for adventure. Rainforests, wetland estuaries, alpine meadows, mountain peaks, coastal beaches and arid deserts are rich with beauty and adventure options for hikers, climbers, bikers, paddlers, and campers. There is plenty of room to roam with Washington's two major mountain ranges, the Cascade Range and Olympic Mountains, and three national parks, Olympic National Park, Mount Rainier National Park, and North Cascades National Park. Though there are over 4 million acres of protected wilderness in Washington, national parks and campgrounds can often be crowded and reservations difficult to obtain. Stretch your legs, adventure a bit farther from the crowds, and find a campsite to call your own under the starry sky. Go backpacking. 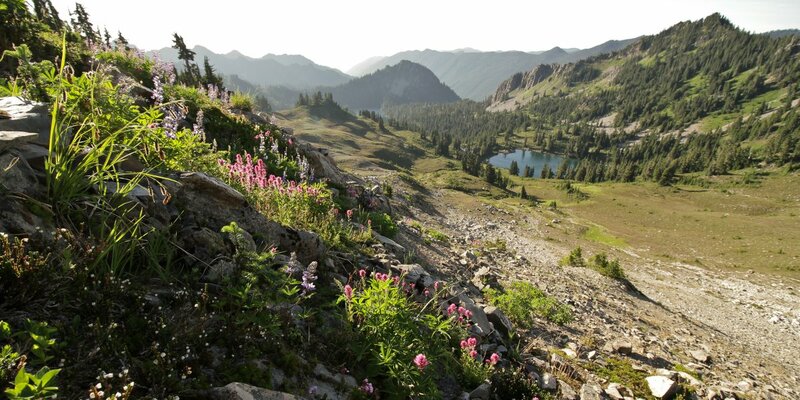 Here are a few of our favorite, and most rewarding, backpacking trips in Washington. The view of Seven Lakes Basin from the High Divide Trail. Photo by Heron Marychild. Hoh to Sol Duc via High Divide Trail: This 26-mile thru-hike in Olympic National Park encompasses a diverse range of ecosystems and offers an excellent sampler of some of the highlights of this unique park. Plan on four to five hiking days to complete the trip, and consider a layover day at Hoh Lake or in Seven Lakes Basin in order to explore this alpine wonderland without a pack. Anderson Glacier via Enchanted Valley: The Anderson massif is one of the most visually stunning, physically imposing, and geographically significant mountain regions in the Olympics. Its glaciated peaks are the most substantial in the eastern Olympics, and its central location makes it an apex for drainage from the Olympic Range. This trip is 40 miles in total. Olympic South Coast Wilderness Trail: Two sections of the Olympic Peninsula's coastline are completely undeveloped and uniquely spectacular. The first is a section of the Olympic North Coast Wilderness Trail that runs nearly 21 miles between Rialto Beach and Ozette. The second is this southern section that runs between La Push (Third Beach Trailhead) and the Hoh River (Oil City Trailhead) and totals 17.5 miles. Thornton Lakes and Mount Triumph from Trappers Peak. Photo by Tyson Gillard. Thornton Lakes Trail + Trappers Peak: Like so many of the best hikes in North Cascades National Park, this trail demands a lot - 10.6 miles there-and-back and nearly 3,500 feet of elevation gain - but the reward of 360-degree views of the surrounding North Cascades and lake-filled cirques is absolutely worth the effort and scramble it takes to get to the top of 5,966-foot Trappers Peak. Cyclone Lake: Cyclone Lake, accessed by a 7-mile trail, is the largest and highest of the alpine lakes that lie on the flanks of Snowking Mountain in the North Cascades. Lake Ann: Often snow-covered well into the summer hiking season, Lake Ann rests in the shadow of Mount Shuksan. Said to be one of the most photographed mountains in the world, Shuksan steals the show from this trail's namesake lake as it rises 9,131 feet into the sky. 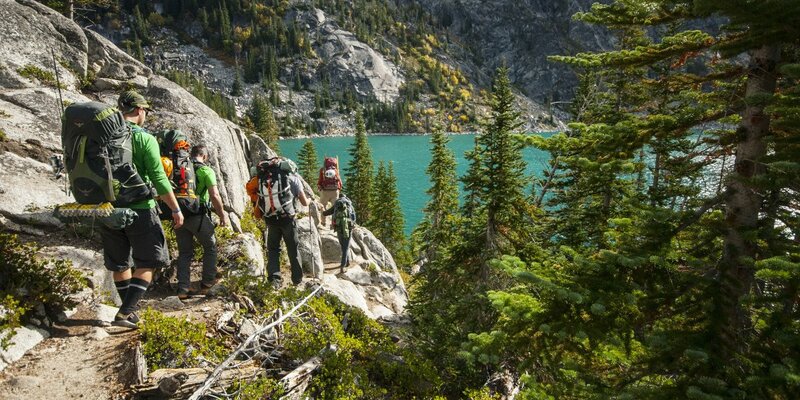 Purple Pass Hiking Loop: This two-night hiking trip is one of the premiere hiking loops near Washington's Lake Chelan and provides incredible views of the North Cascades. The route leaves from Stehekin, and it is perfect for people looking for beautiful views of a stunning lake, massive Cascade peaks, the isolation of the Lake Chelan-Sawtooth Wilderness, and a relatively moderate trail. Departing Colchuck Lake in the Enchantments. Photo by Tyson Gillard. Enchantment Lakes via Colchuck Lake: Alternately known as the Enchantments or Enchantment Lakes, this eastern-slope high-elevation basin in Washington's Alpine Lakes Wilderness is home to some of the best hiking in the Pacific Northwest. Permits are hard to get, but it's worth the effort. Spade Lake: Nestled in a rocky basin high on Mount Daniel, Spade Lake is one of the least visited lakes in the Alpine Lakes Wilderness due to it's distance from the nearest trailhead (13 miles). Even so, it is worth the effort of hiking on some stretches of rough, steep trail to experience the serenity and see the rich turquoise water of this lonely lake. Chain + Doelle Lakes: Less celebrated than lakes in the Enchantments, but no less beautiful, Chain and Doelle Lakes are a must see for backpackers seeking solitude in the Alpine Lakes Wilderness. Hikers aiming for these lakes will also get to experience a section of one of the most famous trails in the country, the Pacific Crest Trail. Snoqualmie Lake: Set aside a weekend for this hiking excursion, because once you get to the lake, you won't be in a hurry to leave. Just over the ridge from Lake Dorothy, Snoqualmie Lake offers ideal lakeside camping, fishing and plenty of solitude. The 13 miles are manageable as a day hike, but don't be fooled by the net elevation gain of 950 feet. One must hike over a ridge to get from Dorothy to Snoqualmie, so the total gain ends up being over 2,600 feet round trip. 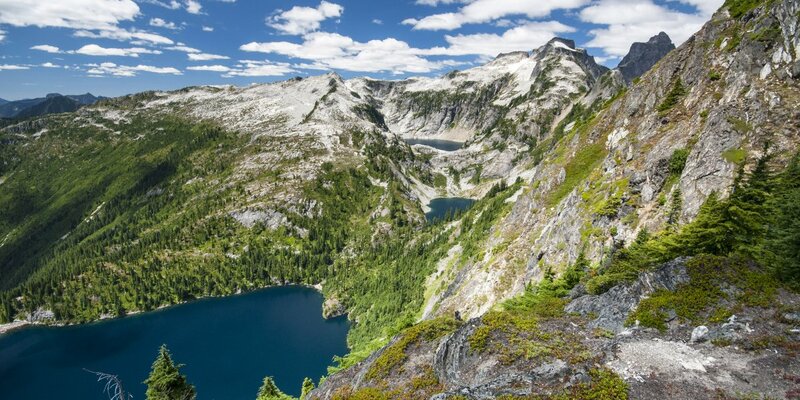 Gem Lake + Wright Mountain: This hike begins at the Snow Lake Trailhead in Snoqualmie Pass, which is justifiably the busiest trailhead in the area. But don't let that scare you away! The hikers who have the extra curiosity (and stamina) to venture a few miles past the gorgeous shores of Snow Lake will be rewarded with much smaller crowds and a beautiful, crystal-clear alpine lake surrounded by jagged peaks. Mount St. Helens from Norway Pass. Photo by Daniel Sherman. Whittier Ridge Trail from Norway Pass: Whittier Ridge is a loop trail that spans between Mount Margaret and the Mount Margaret Backcountry Lakes. The loop total is a strenuous 14.2 miles with over 2,000 feet of elevation gain. 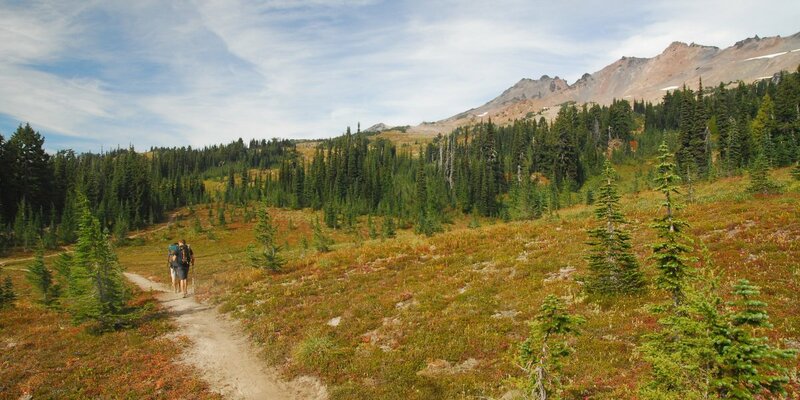 Due to the close proximity to the Mount Margaret summit, it is convenient to combine the two in a single trip. Mount Margaret via Norway Pass: The 1980 eruption of Mount St. Helens is one of the most iconic geological events in American history. Thousands of visitors flock to the mountain and surrounding area annually to view the aftermath of this incredibly destructive force. 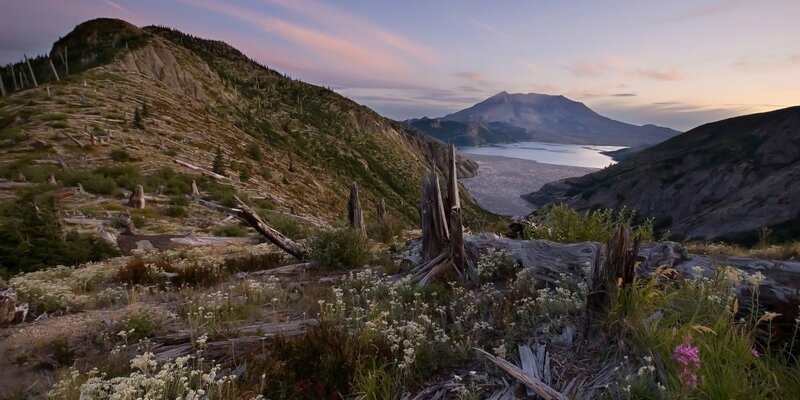 For visitors who are looking to take in the beauty of the reshaped terrain and marvel at the spectacular prominence of Mount St. Helens and the surrounding cascade peaks, a hike through the Mount Margaret Wilderness provides perhaps the best, least crowded option. Mount Rainier from Gobblers Knob lookout tower. Photo by Tyson Gillard. 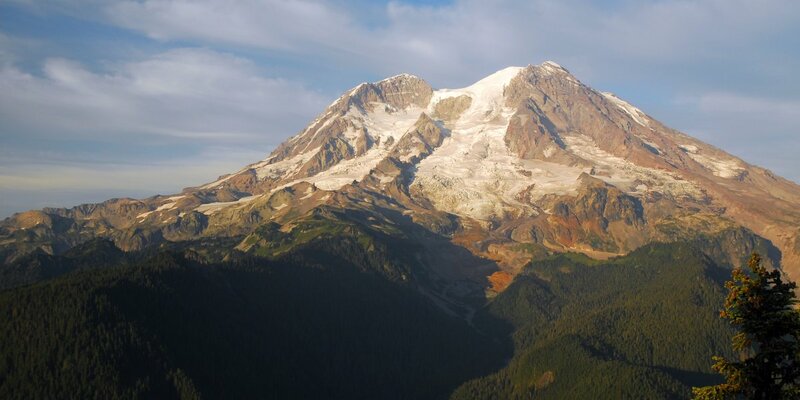 Summerland + Panhandle Gap: One of the most popular hikes in Mount Rainier National Park, Summerland offers stunning, close-up views of 14,411-foot Mount Rainier, serene spring-fed meadows, and thundering waterfalls. The optimal time for travel is early June through late August; snow cover can hinder the hiker's pace any earlier or later in the season. Gobblers Know + Lake George: Of all the destinations on Mount Rainier's west side, the turquoise waters of Lake George and the lookout tower at Gobbler's Knob are the most accessible and provide the most dramatic views of the 14,411-foot stratovolcano. Greenwater + Echo Lakes: Sometimes a trail can be a destination in and of itself, and the Greenwater Lakes Trail is a perfect example. Located in the Mount Rainier area, but not inside the park, this 7-mile trail leads to a beautiful lake ideal for summertime swimming. Hiking to Goat Lake. Photo by Tyson Gillard. Goat Lake: Located in what seems to be the "middle of nowhere," sandwiched roughly halfway between Mount Rainier and Mount Adams, Goat Rocks Wilderness is quickly becoming a favorite backpacking and hiking destination, and the nearly 14-mile loop trail up to Goat Lake is certainly its most popular adventure.